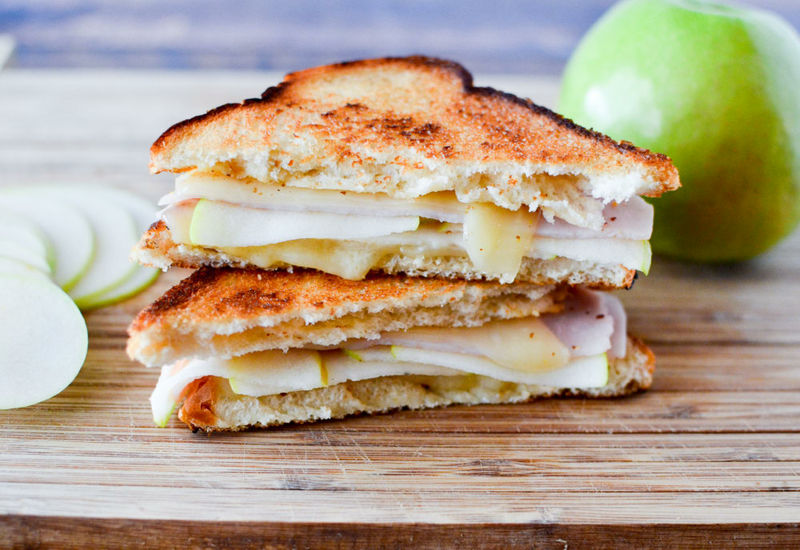 Not your average grilled cheese sandwich, our version with turkey, apple, and Swiss cheese is kid-friendly and great for lunch. Made with a Dijon-honey mustard spread, whole-grain bread, and Granny Smith apples, these sweet and savory sandwiches are perfect for even the pickiest eaters. Switch it up and try red apples or pears instead of Granny Smith apples. Per Serving: 323 calories; 5g fat; 39.0g carbohydrates; 30g protein; 47mg cholesterol; 1111mg sodium. I wasn't sure what to make of this jazzed up grilled cheese at first, but it was surprisingly delicious! I used a slicer to make really paper thin slices of apple, and actually the sweet and sour taste paired really nicely with the Swiss and turkey. Now I'm craving it! I gave my husband a bite, he agrees, it totally our new favorite. These grilled cheese sandwiches are really good. The green apples are definitely my favorite. They pair perfectly with the turkey and cheese. I also use Creole mustard for spread, so delicious! Made this recipe with thin sliced pears and it was really good. I made my sandwiches quite thick, using extra turkey. Great for a quick lunch. Put this together rather quickly using red apples and turkey. Nice spin on a classic sandwich. Also a big hit with the kids. I toasted the bread instead of using a skillet to grill. Switched this up a little by using provolone cheese and sliced deli chicken instead of turkey. Super simple and sweet.